Here in northern California, tomatoes are still going strong despite the unusually cool summer. And with the autumn equinox—September 22—just a few days away, now is the time to make this sauce! It’s delicious and super easy. Forget about peeling and seeding tomatoes; it is just not necessary. But do be mindful: The more flavorful the tomatoes, the better the sauce. 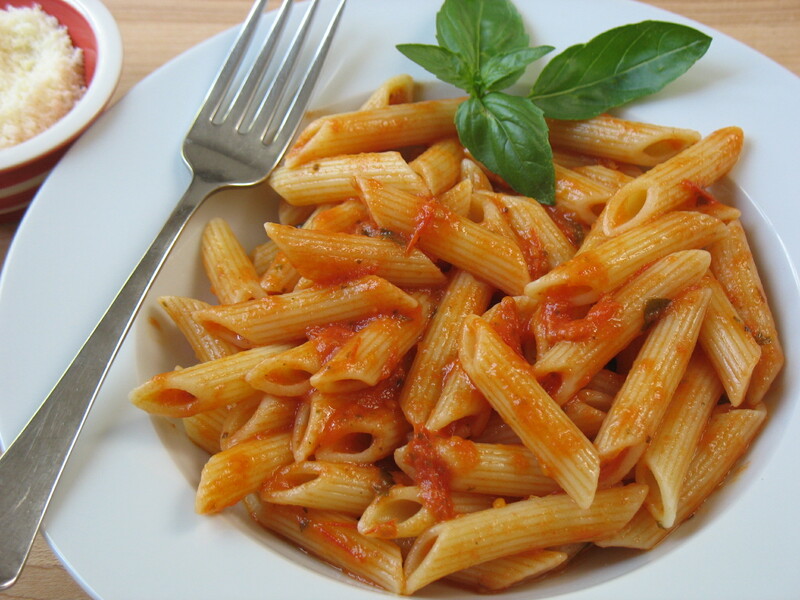 Use 2 pounds very ripe tomatoes to make 2 cups delicious sauce. See my kitchen notes for making bigger batches. Prep Time: 1 hour (most of it is simmer-on-the-stove time). Makes 2 cups sauce from 2 lbs tomatoes. In a 4-quart saucepan, cook onion and garlic in olive oil over medium heat for 3-4 minutes. Add tomatoes, carrot*, dried oregano and basil, and salt; stir. Bring to a boil. Reduce heat to medium and boil gently, uncovered, 30 minutes, stirring occasionally. Partially cover pan; cook 15 minutes more. Remove from heat. Add fresh basil leaves, if desired. Use an immersion blender to puree tomatoes and basil. Serve immediately tossed with hot cooked pasta. Season with grated cheese, salt and fresh-ground pepper, as desired. If the tomatoes are sweet, the carrot may not be needed. The total time the sauce cooks is a bit subjective. It depends on how the heat is adjusted, the type of pan used (thick-sided or thin), and how much liquid cooks off. The final sauce should not be too thick or too thin. Sept 24, 2009: I cooked about 6 lbs ripe tomatoes in an 8-quart pot for 45 minutes uncovered + 15 minutes partially covered. More tomatoes need a longer cooking time to reduce the liquid and intensify the flavor. Yield was about 8 cups. I froze the sauce in 2-cup portions. Then for super fast dinners throughout the autumn, I reheated it in the microwave oven. Yummy…we have tons of tomatoes…am definitely going to try this! Made this last night…I finally had enough tomatoes at once. Wasn’t sure the number of lbs I had so the the amt of onion, garlic and spices I was guessing on. We all loved it…so healthy! The hubby suggested more garlic and onions. I’m going to start raiding my neighbors tomato plant to so I can make enough to freeze and have during the winter months. Glad you liked it, Maureen. It’s pretty easy to make your own tomato sauce, huh? !